Wooden sled, felt, belts, fat and rope. Appox. 170 by 60 cm. Color offset on cardstock, with handwritten text. 99 by 60 by 0.2 cm. Edition: 100 plus XII, signed and numbered; plus 12 copies on white paper mounted on cardboard, signed, unnumbered. Two tin cans, one with brown paint (Browncross); string, label. Cans 12 by 10 cm dia. each. 28.5 by 11 by 10.5 cm. Edition: 40 plus V, signed and numbered. 32 by 44 by 0.9 cm. Edition: 50 plus X, signed and numbered. Light bulb with plug socket, in wooden box; lemon. 8 by 11 by 6 cm. Edition: 200 plus a few a.p., signed and numbered on certificate. Publisher: Edizioni Lucio Amelio, Naples. Mitchell-Innes & Nash is delighted to announce a large-scale exhibition of Joseph Beuys multiples from the collection of Reinhard Schlegel. Consisting of over 500 works spanning from the early 1960s to his death in 1986, this exhibition is the most significant collection of Beuys multiples to be shown in New York to date. Iconic pieces such as Sled (1969), Felt Suit (1970), The Silence (1973), Art=Capital (1980) and Capri Battery (1985) will be on view starting March 13, 2015. The multiples carry a special significance in Beuys’s oeuvre; he once said: “If you have all my multiples, then you have me completely.” Connected to his ambition to affect social change through art, the multiples allowed Beuys an avenue to disseminate his ideas at greater range. Each multiple in the collection encapsulates a specific moment, performance or idea in Beuys’s practice, and are laden with symbolic meaning. Capri Battery, for instance, is one of the last multiples Beuys created and connects a natural object (the lemon) with a pinnacle of human innovation (the light bulb), signifying ecological balance between man and nature. Beuys’s work is heavily influenced by his controversial personal history. During World War II, Beuys volunteered for the German Air Force. By his own account, Beuys’ plane was shot down on the Crimean Front in 1944. He recalls being rescued by nomadic Tatar tribesman who wrapped him in animal fat and felt and nursed him back to health. Though the factual accuracy of this story has been called into question, the account of his near-death experience in Crimea serves as a powerful creation myth in Beuys’s artistic identity. Felt and fat are among Beuys’s most often used sculptural materials and serve as metaphors for the potential for change and the release of creative energy. Joseph Beuys (1921-1986) was one of the most influential German artists of post-war Europe. He was a sculptor, performance artist, printmaker, political activist, and teacher, who challenged the idea of traditional forms of art. Beuys was an important contributor to the Fluxus movement, the influential, ongoing avant-garde group that includes Yoko Ono, John Cage, Nam June Paik, among others. Artists associated with Fluxus share an anti-market sentiment in their art-making and, like Beuys, champion the possibilities of artistic creation to enact positive social and political change. Famous for his often-quoted saying, “everyone is an artist,” Beuys sought to activate the intellectual and creative capacity in all human beings, culminating in his notion of “social sculpture,” in which the power of art is activated to transform society. Beuys’s revolutionary performances pushed the boundaries of what can be considered art, while also engaging with symbolism. In his 1965 performance How to Explain Pictures to a Dead Hare, Beuys locked himself in the gallery, allowing viewers to watch only through the glass window. He covered himself in honey and gold leaf and cradled a dead hare, whispering into its ear. Juxtaposing man and nature, honey from bees symbolizes community, warmth and brotherhood, while the rational activity of ‘explaining pictures’ to an animal, highlights both the power and limitations of human intelligence and creative power. Complete or near-complete sets of Beuys’s multiples are very rare. In the United States, the largest collections are in the Walker Art Museum in Minneapolis, Minnesota; the Harvard University Art Museums in Cambridge, Massachusetts, and the Broad Art Foundation in Los Angeles, California. The exhibition of Beuys’s multiples presented by Mitchell-Innes & Nash is the most extensive collection of multiples to be shown in New York to date and is available for sale as a complete set. The exhibition will be curated and installed by Professor Dr. Eugen Blume, Head of the Hamburger Banhof in Berlin, Germany. Eugen Blume is the leading Beuys scholar and curated the highly successful Beuys: We are the Revolution show at the Hamburger Bahnhof in 2008-2009. In addition to his museum work he is a professor at the Bremen High School for Arts and Design, Germany. The exhibition will be accompanied by an illustrated publication with an essay by Eugen Blume. Ten minireviews can’t do justice to Chelsea’s art offerings. MITCHELL-INNES & NASH has a museum-quality, nearly comprehensive show of Joseph Beuys’s multiples (at 534 West 26th Street, through Saturday). The German social sculptor looks less hermetic than usual, thanks to the show’s emphasis on his political activities, notably his Organization for Direct Democracy, which advocated decision-making via citizen referenda. (“Conquer the dictatorship of the parties!” he scrawled on a photograph of himself wielding a silver broom.) Beuys designed the German Green Party’s campaign poster in 1979 (he was also one of its losing candidates). It shows a giant hare, one of the artist’s favorite symbols, facing down an infantryman—its title is “The Invincible.” Through April 18. Opening today, Mitchell-Innes & Nash presents an exhibition of Fluxus artist Joseph Beuys’s multiples from the collection of Reinhard Schlegel—the largest collection of Beuys multiples ever shown in New York, featuring over 500 works dated between the early 60s to his death in 1986. It’s truly rare to see a set multiples from Joseph Beuys, the German performance artist and sculptor active mainly during the ’70s and early ’80s before his death in 1986. Thanks to Reinhard Shlegel, Mitchell-Innes & Nash will show over 500 of these works related to his oddball performances about history and Beuys’ personal life. From the 1960s until his death in 1986, German artist Joseph Beuys produced some 557 multiples — small-scale portable and affordable pieces that captured an element of his practice. Joseph Beuys: Multiples from the Reinhard Schlegel Collection, opening today at the Chelsea gallery Mitchell-Innes & Nash, includes over 500 such works by Beuys, the largest exhibition of his multiples yet shown in New York. Through his vast body of work, the late German artist Joseph Beuys blurred the boundary between artist and theorist. Opening March 13 at Mitchell-Innes & Nash in New York, a new retrospective offers an intimate glimpse into Beuys's masterful oeuvre and influence, alluding to many of his more radical conceptual ideas such as social sculpture, in which he considered society itself as one collaborative work of art. The month-long show will present past performances as well as installation and and sculptural works that date between 1965 and 1986, the year of his death. 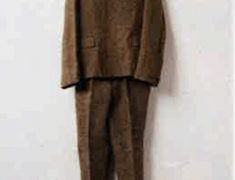 Included in this selection is one version of Beuys's iconic 1970 piece Filzanzug (Felt Suit), a tailored suit that was modeled after his personal garments and operates as something of a shostly self-portrait of an artist whose impact is still being felt today. Essay by the curator Eugen Blume; included in the limited edition, illustrated publication produced in conjunction with the exhibition. List of exhibited films & recordings featured in Joseph Beuys: Multiples, From the Reinhard Schlegel Collection. Illustrated publication with an essay by the curator Dr. Prof. Eugen Blume; produced in conjunction with the exhibition. Selections from Joseph Beuys editions Catalogue of the Schlegel Collection.